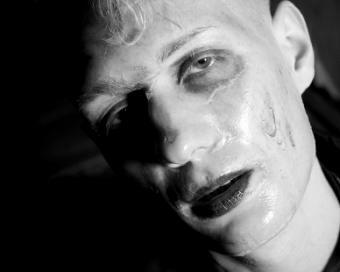 If you are looking for the perfect spooky look, Halloween makeup for corpse themed costumes might be your perfect find! Many items can be purchased at your local drugstore, and anything else can be ordered online or picked up at one of the many costume shops that crop up in towns all over the U.S. during this time of year. 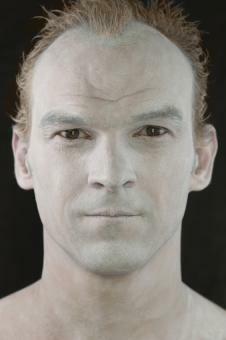 White face paint (you can also use a pancake foundation much lighter than your natural skintone). 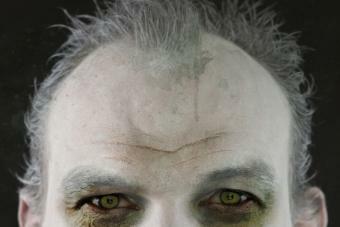 Grey face paint (if you don't have sensitive skin, you can even use craft paint to get that perfect deathly look). Yellow and brown eye shadow. Also consider investing in some grey or silver if its within your budget to do so, as you can use it year round for other fun cosmetic looks. Wash your face with your usual products and make sure your skin is completely dry. Hold back from applying any moisturizers or lotions that cause your skin to be too "slippery" or unable to hold the makeup properly. Some experts suggest waiting about half an hour to start your makeup after cleansing, so your skin has time to naturally balance out and handle the new cosmetics effectively. 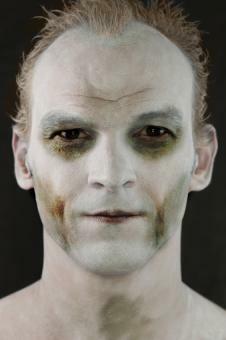 Start out your corpse makeup by using the white face paint or pancake makeup. Pancake is recommended because it allows ideal coverage without clogging up your skin in an unfriendly way. It also allows your natural skin tones to show through, and applying sparingly or generously on certain parts of the face allows for successful variations of depth and contour that add to your overall effect. Divide a large makeup sponge into quarter pieces, providing you with an ideal edge for tricky spots like under the eyes. Stay away from the smooth precut triangles used for usual cosmetics application, as the foam sponges allow for more absorption of color and easier transfer onto the skin. Run the sponge under water and wring it out until it is only slightly damp. Having the sponge too wet will cause the pancake makeup to be runny, so use water sparingly. Take the sponge and rub it around the pancake until you have sufficient paint. Wipe the sponge all over your face and go for more pancake when the color gets too thin. Apply a thicker amount under the eyes and thin it out more around your jaw line. Stopping at the jaw line gives you an effect like a mask, however you can extend down your neck if you want your makeup to blend directly into your costume. Some choose to also use pancake on their hands, but remember it will come off on anything you touch! Use the grey face paint on your cheeks and under the eyes to give your skin sallow and lifeless contours. Line your upper and lower lids with the brown eyeliner (liquid works best if you have it) to bring accentuation to your eyes and make them look larger and more ominous. Apply the white or grey mascara generously, so you can get ready to give a frosty stare of death to everyone you encounter. Use the yellow, brown, or grey/silver eye shadow under your eyes to give a sunken effect. Finish off with a grey or pale pink lipstick to make your mouth thin and lifeless. Using fake blood or the various adhesive skin lacerations available around this time of year can boost your overall corpse motif and give you a perfect platform to tell a great story as to how you died. If you don't have a steady hand or are just plain intimidated by the idea of creating such a deathly look, makeup kits can be purchased at all Halloween stores. Since a corpse is such a common costume idea, even local grocery stores sometimes supply these kits that include all necessary makeup and templates.